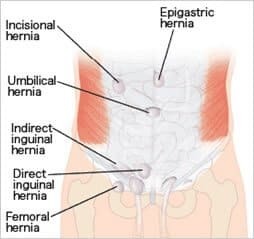 Our specialty clinic for hernia surgery is dedicated to the diagnosis and treatment of all types of hernias. Our preferred approach is with minimally invasive keyhole surgery to allow early recovery and superior functional outcomes. A abdominal hernia is the protrusion of abdominal contents through muscular defect in the wall of the abdominal cavity. It can be found in different locations in the abdominal wall, or it can arise at the site of a previous surgical incision. A hernia can be recognised by a swelling that may cause discomfort. Surgery is usually advised to prevent complications such as bowel obstruction and strangulation.